Golden Tech’s Alante Sport is a high-quality indoor power chair. It has 9″ drive wheels that are non-marking on high-strength steel rims with shiny hubcaps. It also has a black and red shroud design that is stylish and functional because it protects the motor and batteries. 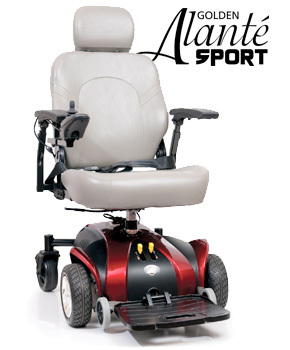 The Alante Sport also comes with a lap belt for safety and an adjustable footplate and width adjustable armrests. The size of the Alante Sport is great for indoor use, whether you need it for in your home or going out to appointments and shopping. It has an 18″ wide and 18″ deep captain’s seat that is height adjustable and comfortable for all day use. The overall width of just 22″ allows this chair to fit through narrow doorways and aisles with ease.